They say it’s a visionary who plants a tree when he knows he won’t live long enough to sit in its shade. The same could be said of the farsighted leaders of Hill County in the 1920s who wanted to invest in higher education. They had an uphill battle with aginers who were quite vocal. The plan was impractical, they said, fearing the college would go bust and all their hard-earned dollars would be wasted. In all fairness, these folks were just being practical. They weren’t an entire generation removed from the pioneers who first carved homesteads out of the rolling hills of North Texas. They were hard-working sodbusters … cotton farmers and ranchers, most of them, who weren’t highly educated. Pressing issues for them were more on the survival level: Weather, fire, disease, water, crop prices … College just wasn’t a top priority. Notwithstanding, Hillsboro became an early adopter in the statewide junior college movement. 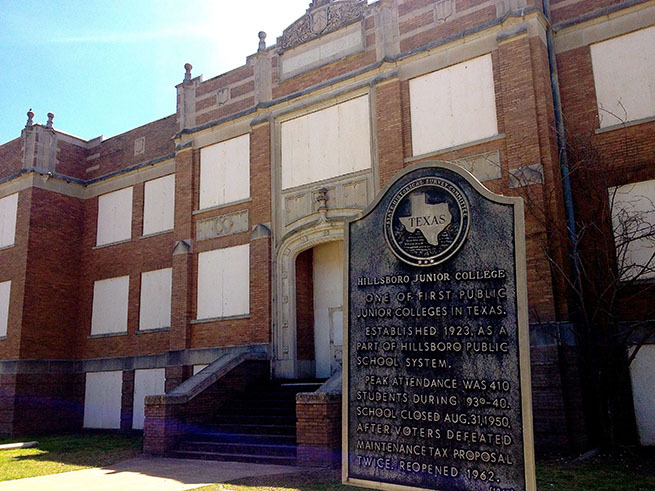 Hillsboro Junior College would be one of the first public junior colleges in Texas when it was established in 1923. Its humble first session began with six faculty members and 52 students. In all, 87 students were officially enrolled that first year for at least one term. They enjoyed an impressive new building and overwhelming community support. By 1927, Hill Junior College’s facilities were considered state of the art, and its campus was highly desired for conferences. What changed the voters’ minds? Taxpayers were brought to see how a junior college could strengthen their community and help their children achieve a better life. Advocates realized that many taxpayers were envisioning an expensive, multi-structure college. So, they toned down the rhetoric, pitching instead the idea of simply extending high school two more years. That idea seemed much more practical and affordable to many voters. Finally, a bond issue of $25,000 was proposed and City Council called an election for April 5, 1921. 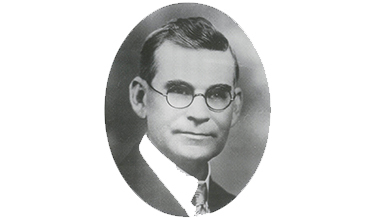 One champion was J.C. Butts, editor of the Hillsboro Evening Mirror. Although he also printed opposing views, his editorials strongly endorsed the initiative of John G. Read, president of the Board of Education for the Hillsboro Independent School District, and A.M. Frazier, an active member of the board. 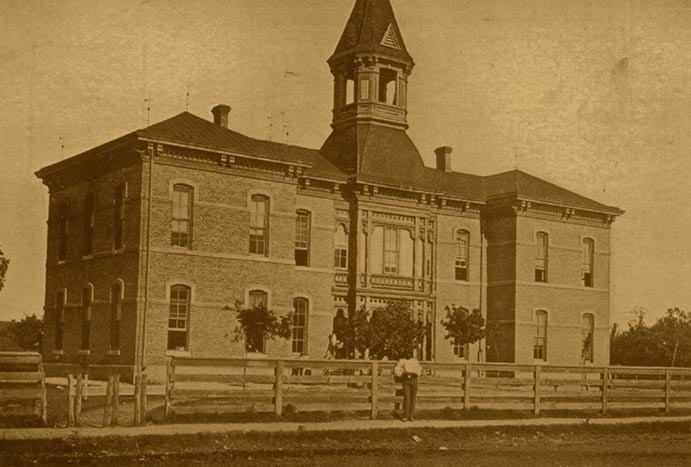 From as early as 1919, Read contemplated and even discussed the possibility of a junior college in Hill County. Soon he and others were presenting the idea to the Lions Club, the Rotary Club, the ladies’ study clubs and the Chamber of Commerce, which sponsored open public forums on the topic. The day before the election, the Hillsboro Mirror used its front page for a lengthy argument in favor of the college, written by A.W. Young. He argued that the junior college would be of tremendous benefit to local young men and women by giving them better preparation for life and that it would have great cultural value to the community. He also made an economic argument: “the addition of two grades to our High School would be a splendid investment financially. It would bring to us as permanent citizens many families who are seeking a location in some small city with first class educational advantages.” The bond passed 295 to 225. Construction was delayed due to slow sale of the bonds, but they did eventually sell. What happened next was totally unexpected, though. The high school burned down April 6, 1922. The townsfolk were in shock that just when they were about to take such a big step forward, they were thrown for such a huge loss. High school classes had to be worked into the schedule at the elementary school, and the daunting task of rebuilding was begun. As is often the case, opportunity arose from the ashes of catastrophe. The city had to pass another building bond, this one for $80,000; but now they and the HISD could pool resources to build the ideal structure for their joint high school/junior college. And upon that foundation they applied further vision, which became exemplary throughout the United States. By 1927, they had adopted a system of five elementary grades, then four and four, which was unique and recognized throughout the nation. That grand building served as many as 500 students in its prime, and continued to serve the community until 1999 when, due to the need for cost-prohibitive repairs, it was vacated in favor of modern school buildings. But it remains an awe-inspiring edifice in the 300 block of E. Walnut for all to see and gain inspiration. An historic landmark on Walnut St. The first year, tuition was $100 … for the entire year. That generated enough revenue to maintain and operate the college. • Helm, Willie, “History of the College,” The Guiador 1928, a Hillsboro Junior College student publication.